Graphic design, photography, art, anything you can create. Imagine living in a world without technology- it’s hard to picture! Technology is a part of our every day lives, however technology has been around since the beginning of time. For example, when the fountain pen was created, it was considered new “technology.” As time moves forward, technology seems to develop faster and faster. This rapid advancement of technology began in the late 1800’s, otherwise known as the industrial revolution. Not only was technology changing during this time, but typography was changing as well. During this time, the sans serif was invented, following the geometric style trends. For those of you who don’t know what serifs are, they are known as the small finishings on the end of a letter (Alex Poole, http://alexpoole.info/blog/which-are-more-legible-serif-or-sans-serif-typefaces/). Lettering without serifs were first seen on trains, cars and ships, usually in a grotesque typeface. Sans serifs are easier to read from a distance, as they are blocky and simple. 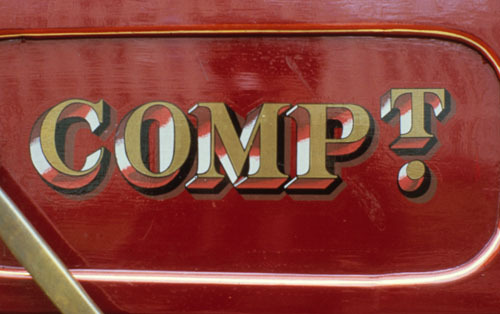 This is why these typefaces were used on large vehicles where you could see the name from a long distance away. During this time, 3D effects and drop shadows were explored in type. Typographers explored new design effects using these blocky drop shadows and contrasting colour on the British Railway. Aside from sans serifs, designers began to consider hierarchy when creating documents such as newspapers, timetables, dictionaries, textbooks etc… In these documents the heading, subheading and body copy are all distinguished through varying weights (bold versus semi-bold) and size. The next time you see writing on the side of a mini van, train, boat or plane, think back to where it came from, and see how typography has evolved since then. Check out these cool blogs about type during the 1800’s, and read more about sans serifs!